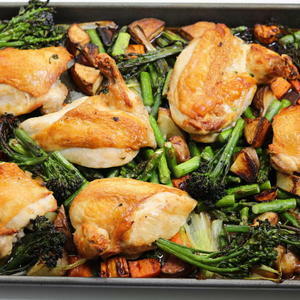 Cooking an entire meal on a single baking sheet is a great alternative to classic one-pot recipes. This no-stress, no-mess chicken dish is a dream. It’s so easy. Arrange everything on the pan. Pop it in the oven and dinner’s ready! And you have ONE pan to clean. Feel free to substitute any other veggies. Enjoy!